People often ask about the process of transforming a quickly-typed email or an informal voice recording into a concise, perfected, professional message. The initial draft and the finished product are clear, but what happens in the middle is a mystery. Allow us to pull back the curtain. When you type or record your message and click the “Wordzen” button to send it to us, your draft is automatically added to our incoming queue. The editor(s) on duty can view all the emails in the queue, and each time a new one is received, they also hear an audio signal. Typically, editors tackle messages in the order they are received. Occasionally, one of our customers will send us a lengthy email that requires extra time to polish. In such cases, we’ll notify the writer of the long email that we plan to take extra time to work on their message. During this time, we’ll interrupt that work briefly to edit any short emails that arrive in the interim so that the writer of a two-line email (e.g., “Confirming Tuesday’s Appointment”) doesn’t have to wait for us to finish an email ten times that length (e.g., “Proposal for a Global Conference”). Voice recordings follow a similar path, except that instead of seeing how many lines are in an email, our editors see how many seconds are in the audio file. Most recordings are well under 60 seconds, so our editors generally handle them in the order they are received — and most users submit their emails one at a time. However, some of our customers use Wordzen as part of an email efficiency strategy, reading the emails in their inbox only once or twice each day and grouping their responses into one or two sessions. Such a “power user” might send us a dozen or more recordings within a ten-minute span. If there are no other messages in the queue, we’ll handle all of these recordings in the order they were sent to us. But if a few messages from other Wordzen customers come into the queue, our editors will typically alternate between customers, editing one or two from the large batch, then one from Customer B, then another one or two from the large batch, then one from Customer C, etc. Taking turns this way, everyone receives service at a fair pace, and the group of 15 or 20 emails from one user doesn’t cause an inequitable delay for others. While they are editing, our staff puts 100% of their attention on the message in front of them. Because our editors are very experienced, they can work rapidly, digging into an email and immediately recognizing what needs to be improved. That’s why Wordzen’s editing is faster than what our clients can typically do for themselves. Our editors have handled thousands and thousands of messages and practice their craft daily, which is why they are the “professional athletes” of business communication. You might wonder how big a role grammar and spelling play in what we do. They are essential, of course, and we are driven to ensure they are correct with every message that leaves our shop. However, grammar and spelling are only the starting point. We take care to evaluate the circumstances, or context, of each email. For example, if our client is writing to their boss to explain a shortfall in performance, the email needs to acknowledge the gap while still representing the writer as a strong and capable person. Also, the writer’s plan for improvement needs to be clear, concise, and persuasive. It’s common that a person in this position might feel insecure, and if this comes through as confusing, defensive, or excessively guilty, we make adjustments to take the tone back to a neutral and professional position. Or, it could be that our client is in sales or marketing in Asia and needs to persuade prospects in the US and Canada. In such cases, English is often the writer’s second language, and the idioms they use might sound “too foreign” to their North American audience. Our editors replace those telltale phrases with others that fit American and Canadian expectations, thus increasing both confidence and sales. In another example, our client might be a busy CEO or high-level business consultant who travels widely and works at all hours. If they’re on the other side of the globe, when it’s midnight back home, they can’t call their administrative assistant to get a raft of important communiqués out within the next hour or two; but they can rely on Wordzen to handle them. Our editors are mindful that the vocabulary and viewpoint in these emails often need to be more formal and sophisticated than what we might use for, say, a young computer technician who favors a casual style when communicating with peers. Our editors can do better work when our client has included all or part of the email thread to which they are responding. This message history provides valuable contextual clues that result in a better-edited result. Also, it helps us with the spelling of names, correct use of acronyms, and a sense of the relationship between the writer and the recipient. Our confidentiality practices are strictly observed, so Wordzen users can share their email threads with confidence. 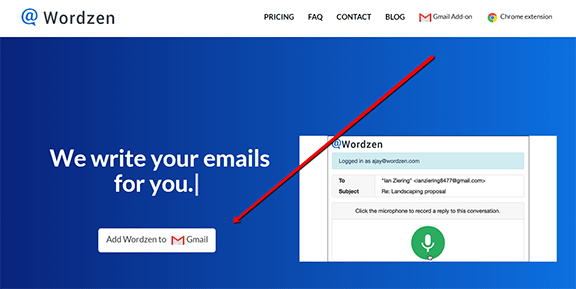 Once a customer has worked with Wordzen for a while, they often feel comfortable choosing the “send directly to my recipient” option, especially when short, simple messages are involved. Our editors are happy to do so, although we reserve the right to return any message to the sender’s Drafts folder if there’s a question or issue we can’t resolve on our end. What’s the benefit of using Wordzen? 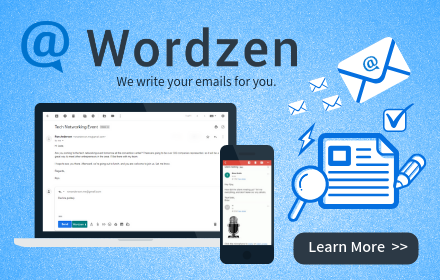 Apart from the obvious – your communications are always smart and polished – emails that have been edited by Wordzen can influence or increase sales, avoid confusion that wastes time, and enhance the credibility of the sender. Whether you’re a great writer or hate writing, supremely confident or insecure, a natural linguist or someone who is uncomfortable about their English, our editors help you raise the level of your game. Will Wordzen’s editors respect the sensitivity of my message? Yes. Our editors are experienced professionals who have dealt with confidential information for years and adhere to a strict code of practice when it comes to your message content. Read more about our confidentiality policy. What if I’m embarrassed about my writing? Don’t be — Wordzen is here to take care of that for you. You’ll find the editing process will build your confidence. First, your recipients will receive emails with correct English. Second, by viewing your edited emails, you’ll learn what you have done right, and what the editors have chosen to change. Finally, most of our customers notice that the longer they use Wordzen, the more their writing improves. How do I start using Wordzen? It’s easy. All you need is a Gmail address and a Chrome browser. Open your browser, go to www.wordzen.com, and choose “Add Wordzen to Gmail.” Note, Wordzen is a paid service, but there is a free trial period for new users. Here is a starter video that shows you how to set Wordzen up, and a how-to-record video that demonstrates how to use the voice feature. If you have any questions, you can contact us at contact@wordzen.com.